When NASA's Phoenix Mars lander set down in 2008, it was at 68° north latitude, analogous to northern Alaska and Canada on Earth. Much of the mission focused on analyzing the soil and water ice found directly underneath the non-roving lander. But the photos Phoenix took of its surroundings looked remarkably similar to ones taken at equivalent latitudes on Earth. In particular, the flat plain extending to the horizon showed a network of polygons (straight-edged geometric shapes) in the ground a few meters (yards) wide separated by shallow troughs. Similar polygons occur commonly on Earth in regions where the ground is deeply frozen but a shallow surface layer warms on a daily or annual basis. When temperatures drop, ice forms and expands. Repeated freezing and thawing of wet soil pushes larger rocks upward toward the surface. Small rocks and soil particles settle under the large rocks in a process called frost heaving. Over many repeated cycles, soil with larger stones contains less water than areas of fine-grained sediments. The water-saturated areas expand and contract more, producing a horizontal force that shoves larger stones into clusters and lines. Eventually such freeze-thaw cycles smoothen out the rough edges to produce polygons, circles, and stripes of patterned ground. A glacier moving across a landscape is like a giant bulldozer: it knocks down nearly everything in its path. Even big outcrops of bedrock don't escape being scarred — bedrock is scratched, scraped, rounded, and has pieces of outcrop torn away. Where does all the debris go? When a glacier reaches its limit — where melting overtakes the flow of ice — the piled-up debris is left in what geologists call a moraine. (The name originated in French.) Glaciers can leave several kinds of moraine, but a terminal moraine is one of the most significant. Terminal moraines mark the farthest advance of a glacier or ice sheet. Long Island, New York, is built from two linked ones: the Harbor Hill and Ronkonkoma moraines. Every moraine represents a line on the ground that marks the outer edge of a glacier or ice sheet. Or it marks where a glacier paused as its front edge retreated. On Mars, scientists have identified probable moraines that were left by glaciers that formed on the northwest sides of the four giant Tharsis volcanoes. But these moraines lie on top of delicate landscape features that a moving sheet of ice would totally destroy. What happened? The moraines, scientists think, were left by cold-based glaciers. These mountain-born ice sheets covered the ground, but the base of the glacier was frozen firmly to the surface and did not move, thus preserving the underlying landscape. The ice sheet flowed internally and dropped debris carried from upstream at points where the ice front paused or stopped. When a glacier is warm-based (or "wet-based"), water underneath the ice seeks to escape. If the water can't sink into the ground under the glacier, it carves or melts a tunnel-like channel into the glacier ice. And like all streams, it carries along sand, gravel, and small rocks as it flows. Now take away the stream and the ice, and what's left? A ridge of small-scale debris meandering in a stream-like way across an ice-free landscape. Such features are common in glacial landscapes on Earth; geologists call them by their Irish name, esker. 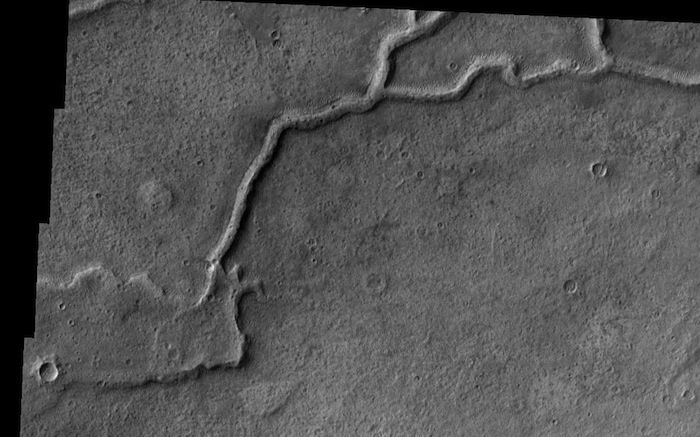 Scientists have identified what may be possible eskers on Mars in several areas. Or they may be ridges that formed in some other way. In many cases, resolving the question will probably require sending a lander or rover to investigate at ground level. Lobate debris aprons are piles of rock debris lying below cliffs or escarpments. They have a gentle slope and many show lineations (lines) on their surfaces that resemble glaciers on Earth that are covered by rocks. Radar studies show that pure water ice makes up the debris aprons under a thin rocky surface coating. 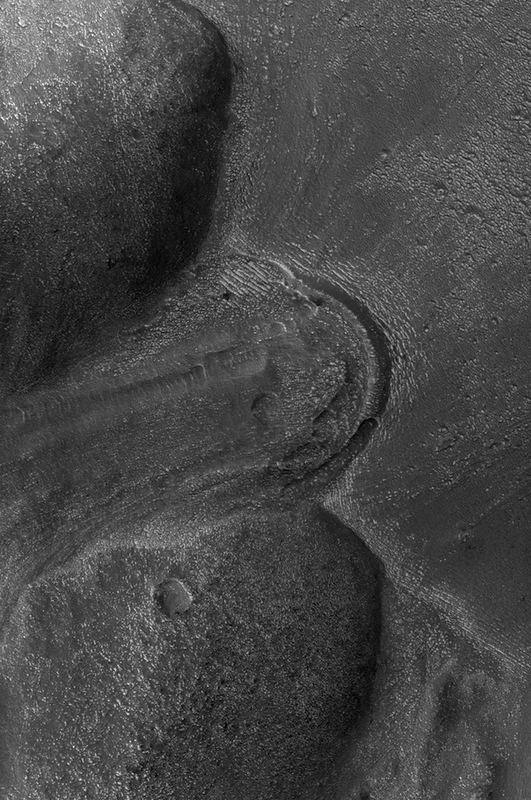 Lineated valley fill appears to be what happens when lobate debris aprons flow enough to fill a valley. 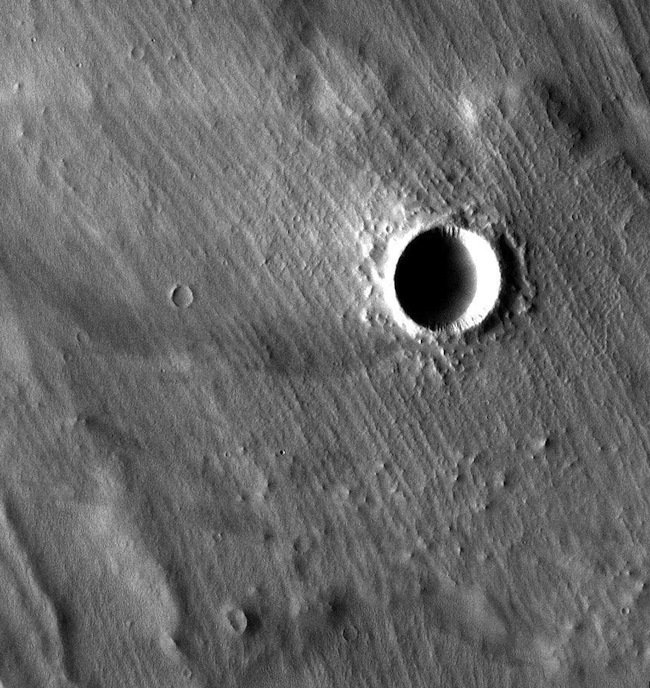 The top surface of lineated valley fill consists of ridges and grooves a few meters (yards) high that appear to flow around obstacles. 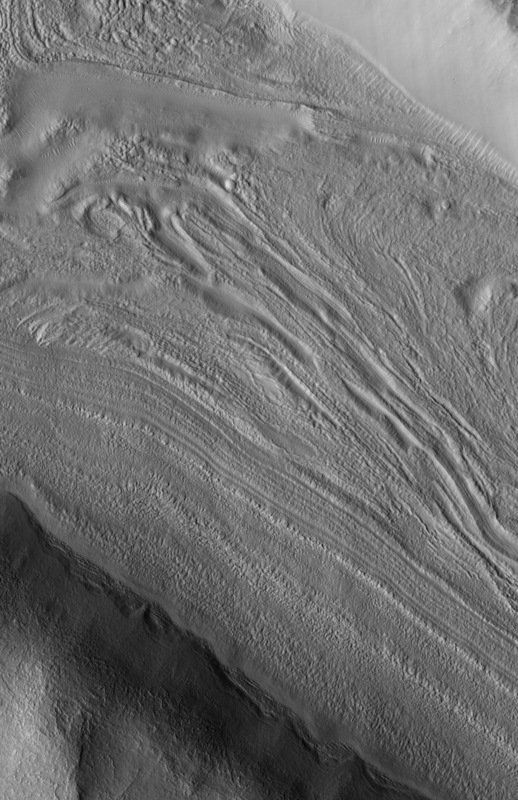 They resemble the flow features seen on terrestrial valley glaciers.